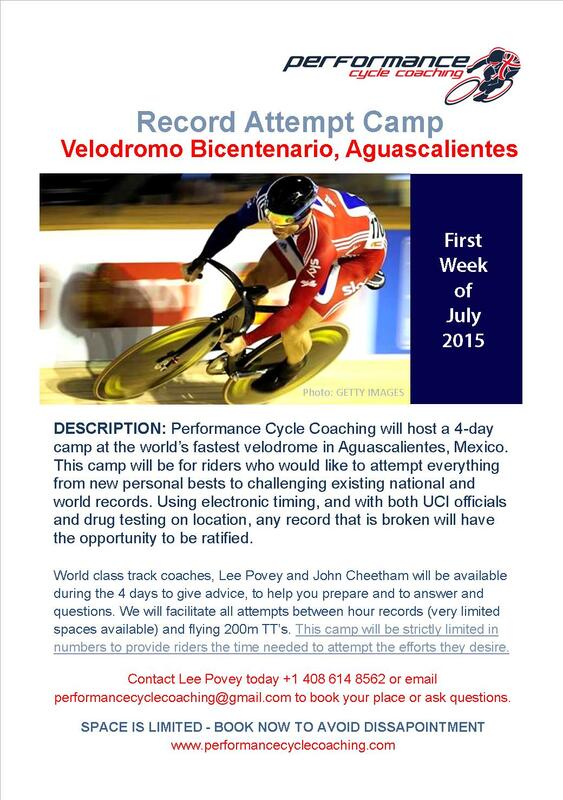 This July 1-4, Performance Cycle Coaching will be hosting a Record Attempt Camp at the Velodromo Bicentenario, Aguascalientes, the world’s fastest velodrome! DESCRIPTION: This camp will be for riders who would like to attempt everything from new personal bests to challenging existing national and world records. Using electronic timing, and with both UCI officials and drug testing on location, any record that is broken will have the opportunity to be ratified. World class track coaches, Lee Povey and John Cheetham will be available during the 4 days to give advice, to help you prepare and to answer and questions. We will facilitate all attempts between hour records (very limited spaces available) and flying 200m TT’s. This camp will be strictly limited in numbers to provide riders the time needed to attempt the efforts they desire. performancecyclecoaching@gmail.com to book your place or ask questions. SPACE IS LIMITED – BOOK NOW TO AVOID DISSAPOINTMENT! !